Natural coloured Jute Bags printed with your own logo. Midpac stock a large range of Jute Bags in various sizes and colours, all of which can be screen printed in small quantities. We also partner a factory in India that produce the bags from Natural Jute in any colour or size. If you are looking for Jute Bags for life with your logo, please telephone 024 7647 3647 or email sales@midpac.co.uk for further information and a quotation. 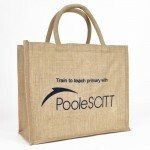 Natural printed Jute BagsStock Natural Jute Bags in various sizes printed with your own company logo..